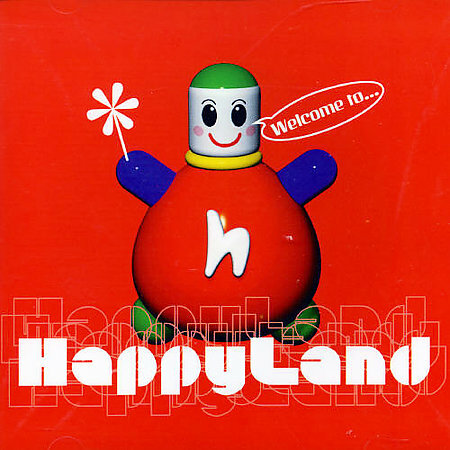 Song of the day: Happyland – "Don’t You Know Who I Am?" Have you seen her rhinoplasty? he’s going to make me a star. my friends all adore me. How could you just ignore me? He’s smoking crack with Billy. they’re making so much money. I’m shining here in my car. pretend you know who we are. I’m a regular reader of some mighty good power pop blogs such as Powerpop, Absolute Powerpop, Powerpopaholic et al, but being antipodean (i.e., from the land of Men At Work, Olivia Newton-John, and Air Supply) I’ve often wondered why Australian power pop records have rarely, if ever, been mentioned on them. I mean, I don’t cry myself to sleep about it, but I think to myself (apart from it being a wonderful world): has anyone outside of Australia heard much power pop from Australia? I’m guessing not, because it seems to me that even with the Internet’s electronic tentacles reaching ever further into homes all around the world, those blogs’ readerships seem to be predominantly American, which makes me slightly sad because there’s so much music that’s come out of Australia over the years, and I’m bursting to let people know about. As a result, here’s a history of power pop in Australia. Before I go on, I must issue a huge disclaimer: I can’t claim to have heard every bit of Australian power pop ever produced, so this list won’t be terribly exhaustive or even authoritative – it’s just a bunch of songs from Australia. This is definitely a history rather than the history. I thought “This is a pop song – and it’s really heavy!” (Well, I was 11.) From then on, I listened for any other “heavy” pop songs that might appear on the radio. In Australia, though, there wasn’t much on offer, courtesy of the aforementioned long-haired hippy songs, novelty songs, and pop songs sung by angelic voices. And that was that – I was completely hooked on power pop. I liked 1972. A few years later came Cheap Trick – and I was even more hooked. Unfortunately, during those formative years I never heard – or even knew about – Big Star until years afterward. (Countdown didn’t played them, and neither did any of the radio stations I listened to.) As a result, the Holy Trinity of power pop (The Raspberries/Big Star/Cheap Trick) was incomplete for me because I hadn’t bonded with Big Star as a teenager (i.e., the music becoming virtually a part of your DNA as your personality forms) as I did with the other bands. I have to admit, though, that even after becoming well acquainted with Big Star, I’m still not much of a fan. This’ll probably sound like sacrilege, and instantly revoke any power pop credentials I may have had up until now, but… I generally find a lot of their lyrics a bit too maudlin (e.g., “Thirteen“), their musicianship painfully sloppy (e.g., “Don’t Lie To Me“), and their melodies not terribly strong (e.g., “Stroke It Noel“), to fully enjoy them. You can call me a heretic now if you like. Maybe I needed to have been an American teenager when I was growing up. Anyway, my musical upbringing will give you a general idea of the sort of music coming your way in this guide. I fully realise that I have my taste in music, you have yours, and the twain may never meet. I certainly don’t want to impose my musical tastes on anyone (especially you). That’s why I want to stress that this guide is just that: it’s a guide, not a commandment. Although there have been – and still are – squillions of power pop bands in Australia, I’ll only concentrate on a few, mainly because they’re the ones I know well. Hopefully, you’ll like some of what’s on offer. I love it all. I’ve grown up with these songs – and I’m glad I did. Have fun listening! Just as every other country in the Western World had their own version of The Beatles in the 60’s, so did Australia – and they were The Easybeats. Depite their early shameless moptop emulation (they later tried becoming The Rolling Stones as well), The Easybeats did produce some great singles that may be considered power pop. I hope so, because it’s about the only remotely power pop-ish Australian band I could think of that was active in the Sixties, and I wanted to have at least one band from each decade. “Friday On My Mind” was written by Easybeats members Harry Vanda and George Young who went on to become a two-man hit factory, writing and producing chart-topping singles for what seemed to be every single Australian performer in the 70’s. I wanted to show you a list of just how many great songs they were responsible for but could only find this page which has an awful lot of song titles but no audio examples. Even the usually-reliable Wikipedia came up short with an unhelpfully small (they call it “selected”, I call it stingy) list on their page for Harry Vanda. But back to the song in question. “Friday On My Mind” was voted in 2001 the top Australian song of all time. That sounds about right to me. Now here’s an unusual version of a sad, sad, sad Beatles song. The only other version I know of that virtually rewrites “Eleanor Rigby” is one by Jellyfish. If ever a season had a theme song then this is it. “Summer Love” is routinely played on the radio here any time the weather warms up (which, in Australia, is often, so I get to hear it a lot). It doesn’t matter where you are or what you’re doing, as soon as this song comes on the radio you’re instantly at the beach on a sunny day and it’s full of people having fun. “Summer Love” probably isn’t power pop at all, but I love it and want at least somebody outside of Australia to hear it. “Things” has the odd distinction of being the only Split Enz single that virtually no-one knows about. This non-album single was released in October 1979, in between 1979’s Frenzy (a fabulous album) and 1980’s True Colours, their breakthrough album (another fabulous album – I like Split Enz a lot). They even made a video for it and everything, but for some reason radio wasn’t interested in it at all, and the song consequently didn’t chart anywhere. Not even in New Zealand, their home country. I still don’t know why radio wasn’t interested in it. I love this song, but I wasn’t a radio programmer in 1979 so I didn’t get a say in the matter. Although Split Enz came from New Zealand, when they became successful in Australia they were automatically adopted by the Australian listening public. I don’t quite know why, but every band from New Zealand who ever had any kind of popularity in Australia was automatically adopted by Australians and claimed as their own. Maybe it’s a little brother thing, what with New Zealand being a little smaller than, and a little to the side of, Australia. Anyway, that’s why Split Enz are in this guide: they’re Australian. This is one of my all-time favorite Australian singles. The Swingers were a three-piece formed by Phil Judd after he left Split Enz in 1978. Although Phil Judd came from New Zealand, he’s Australian (see Part 1’s entry on Split Enz). “Counting The Beat” was The Swingers’ second single and it went to number one in Australia. It also became the highest-selling single for 1981. “Counting The Beat” fever hit so many people simultaneously that, as this unreadable web page says, it “effortlessly roared to the top of the charts faster than any other Australian single in ten years”. Unfortunately, The Swingers were a one-hit wonder. After “Counting The Beat”, the band disappeared and Phil Judd went on to write film scores. Incidentally, if you do listen to this song, the recommended volume level is maximum. As far as I can tell, the Divinyls are primarily known in the US for one song, “I Touch Myself” (video), which is a deplorable state of affairs because the band made some fantastic records. “Boys In Town” (video) was their debut single in 1981 and they let you know who they were right from the get-go. They even recorded a pummeling version of The Easybeats’ “I’ll Make You Happy”. They named their version “Make U Happy” (1982), way before Prince decided to reduce the English language to text messages in his song titles. It was extremely difficult picking only three more songs to recommend because their first three albums – Desperate (1983), What A Life! (1985) and Temperamental (1988) – are full of solid tracks. So I made it four. I know that Neil Finn is mighty good at ‘wistful’ and ‘melancholy’, but he’s equally adept at ‘rockin”. “Mean To Me” is the first track on Crowded House’s 1986 self-titled debut album. I think this is a great, great song. Nevertheless, I hope that you enjoy some, if not all, of the music on offer here. Have fun! You are currently browsing the archives for the Happyland category.